For many locals, the Louis Vuitton America’s Cup World Series event was a bit of glitz and glamour with the racing, the festivities on Front Street and of course, the sailors. But for those of us working, or volunteering, behind the scenes, the event offered some excitement of a different kind. In my case, I had the good fortune of being seconded by the City of Hamilton to the America’s Cup Event Authority [ACEA] for a week to assist in the Media Centre. The Media Centre was a limited-access hub for up to 70 accredited organisations and about 140 personnel such as press, photographers, bloggers and TV crews. Publications and media groups included BT Sport, CNN International, Robb Report, SkyTV, New Zealand Herald, Maxim, Canal+ France, Conde Nast Traveller, Japan’s Mainichi Broadcasting System [MBS] and Yachting World, to name only a few. For the Louis Vuitton America’s Cup World Series there were over 250 volunteers filling a variety of important functions. At the Media Centre this included a dedicated team of eight volunteers working, along with myself and Isabel Genis, the head of Media Operations for the event, to manage the many requirements of the media professionals. The youngest member of our team was 17-year-old Bermudian Arden Vickers. I can relate to Arden’s sentiment and would get involved again in a heartbeat. Situated in the lower level of Pier 6, the Media Centre was a hive of continuous activity with dedicated desk space, Wi-Fi, printer and large screen TVs for monitoring live feeds of the races and main stage activities. 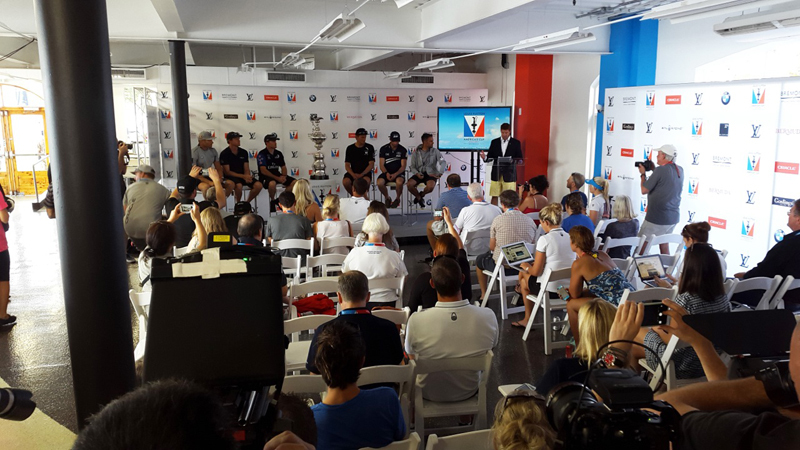 It also hosted a number of the official press conferences and post-racing interviews with the sailors. Some of my responsibilities included managing the media, organising press conferences, booking press boats, acting as a concierge and much more. The days started early and ended late but were worthwhile as I was able to provide an integral service for media from around the world. Like many in Bermuda, I’m looking forward to 2017 and once again being part of making the America’s Cup a success for Bermuda. Thank you Ms. Abraham for the insight into how the important media function of the Louis Vuitton Series came to life in Bermuda. Essentially your talent was a gift from the Corporation of Hamilton to Americas Cup. I imagine there are many similar stories around the island of Government Departments, Companies and Organisations funding their talent to participate and create the success we all experienced – thank you to them all. I hope we hear many more stories from Bermudians involved in the successful weekend and we get a clear sense of how other talented Bermudians can get involved in 2017 – through secondment, paid positions or volunteer positions.